KOER REPORT: Big, Strong, very type and expressive with good body structures. Good head, high Withers, firm back, very good croup situation and -, very good pre and rear spar and bending, correct Brisket in proportion, lengthen clean front. In front clean, in the back easily narrow-stepping, very good precedence and strong supply. Safe nature, UCB pronouncedly; discharges. 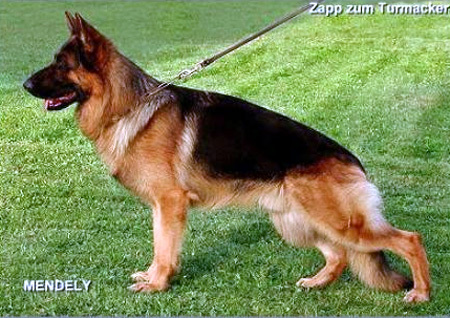 2005 Sieger Show Report: Bigger, strength and substantial, good pigment, drying and firmly, good proportion, normal Structure, in the stop he would have to be more pronounced. High Withers, firm back, good croup situation, very good situation and length of the Shoulder Blade with well angled upper arm, very good rear spar and bending, balanced Brisket in proportion, clean front, in the back closely, stepping in front clean, strong outreaching gait.